If you are unable to visit a real Victorian site with your class you might like to consider a visit to your school by an experienced "Victorian" teacher. The Victorian Domestic Day presents a picture of what home life was like in Victorian times, and draws a contrast between how things are done now and how the used to be. Pupils will be able to see that even making a cup of tea would be difficult. As this can be very practical it particularly suits younger children who have lots of things to do as part of the learning process. We first ask to children to think about how a Victorian child may have got clean water. If they can, children are asked to think of six ways this would be done in the days before water was piped into the home. 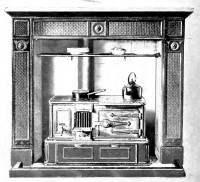 Heating the water is then considered and the kettle and stove introduced. Attention is then turned to washing clothes, and children think about why clothes might have got dirtier in Victorian times. 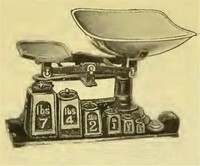 Various washing implements are demonstrated, the washboard, washing dolly, posser and tub. 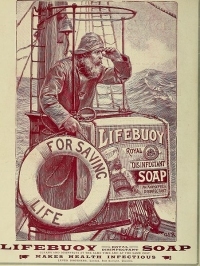 Children generally like the opportunity of smelling carbolic soap. A re-enactment of washing helps to paint the picture. Drying is considered, and dolly pegs are demonstrated. Children can take turns at hanging blankets on the line, and then taking them down and folding them. The mangle is explained and demonstrated (using a safe toy model), and pupils given opportunity to feed washing through the mangle. The flat iron is also shown and explained. We then look at cleaning the person, and we talk about the tin bath and how that was used. Moving on we look at cleaning the house in the days before the vacuum cleaner was widely available. We talk about cleaning the rugs, and children can have a go at beating out the "dust" using a carpet beater. We then get on with jobs like cleaning the boots, and cleaning and polishing the plate. Lots of activity here. On longer visits, or by request, we can go on to talk about Victorian cooking, and the equipment found in the kitchen. The exact content of the day varies with the age and capability of the pupils, and with the time available, but by the end pupils should have some understanding of the differences between the Victorian and the modern household. We can include a session of play with traditional games if required. We can bring clothes for children to wear if required, or you might like to involve parents in making suitable clothes. Our own staff wear Victorian style clothes. We may also be able to provide clothes for teachers or visitors to wear. The clothes can be put over regular school clothes. We bring a number of items to assist in our talk, which varies according to age and local conditions. We bring a selection of washing equipment, cleaning things, and general household items and many other things. For play we bring a selection of Vintage games such as marbles, stilts, top, skipping ropes and diabolos. We can bring a selection of artefacts to illustrate specific talks, such as kitchen and washing items, and domestic items. What we bring will depend upon the time we have with the children, and many other factors, but if you have a particular need please discuss it with us. We need some time to prepare for the lesson, at least 30 minutes. It also takes some time to carry the equipment in, so probably best allow something like an hour for setting up. If we are starting in the morning, then we will generally arrive about an hour before start of school. A lesson takes about 30-45 minutes depending on the age of the children (shorter for younger children). Additional time is needed for playing with the games. Miscellaneous additional charges including materials costs. As a guide price it is likely to cost from £8 per child. If you let us know what you want we will quote an exact price. More details are given in our downloadable synopsis. 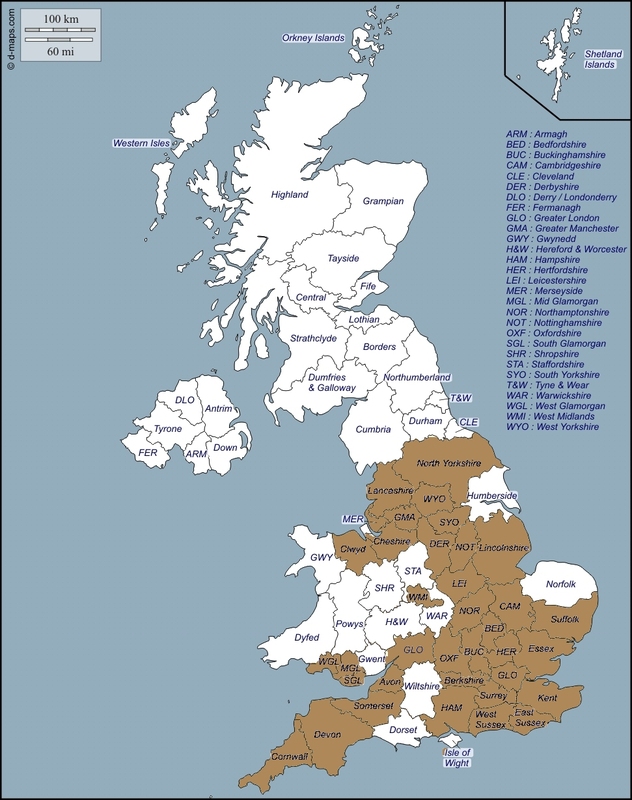 How far do you travel to a school? 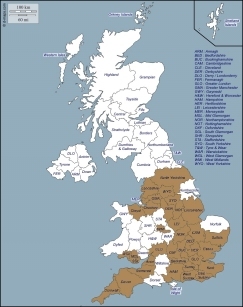 We are prepared to travel anywhere in the UK, but the further we go the more it will cost. If you are a long way from one of our teachers, then it might be best to consider a longer visit to spread the cost between several classes. Can you accommodate specific lesson content requests? We may be able to incorporate specific teaching requests, please ask. We don't have any suitable room in our school. Can you suggest anything? There are many buildings that were probably around in Victorian times which would make a great environment. Think about village and church halls, manor houses, libraries and so on. What is the shortest/longest time you come? 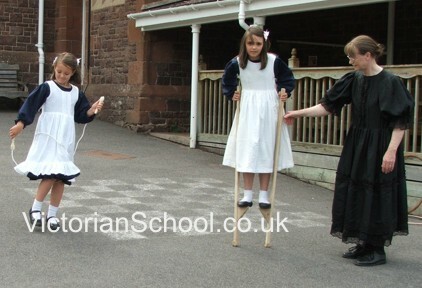 Isn't it better to go to a real Victorian School or recreated classroom? You may be situated too far away from such a facility, or it may not be open when you need it. With a visit to your own school the timetable can be tailored to fit your exact needs. In addition the children will generally get a lot more teaching time. Doesn't it cost a lot more to have a visit to my school against visiting a facility? On the surface it may appear to be more expensive, but when comparing costs don't forget to take into account staffing expenses, travelling costs, and extras such as providing costumes. When we come to you our charge is all-inclusive. Why do you charge for coming? We would love to be able to visit for nothing, but we need money to live, just like anyone else! We are not part of the Museum service or a charitable trust, so we have to pay our way. Some of our earning are returned in free resources available on our website. Will we get an actor or a teacher? A little bit of both. For a successful presentation there has to be some acting, but the main aim is to teach in an interesting way. The children will learn a lot, and many teachers have told us that they have also learnt. Do you do other periods of history or do other types of visits? We do cover other historical periods. You will find them listed in the menu to the left. If you require a cisit that is not listed, please enquire.